Job interviews can be pretty stressful. It seems like you can never win. Saying too much may appear conceited while saying too little can make you look shy, reserved and possibly not as skillful as necessary. In the end, the key factor is to be yourself as much as possible – you don’t actually want to get a job based on a personality you adopted just for the interview, do you? After all, then you’d be expected to act like that at the job as well, which is a complete nightmare. Being yourself is crucial since authentic and unique people receive the most attention; but, you also need to do your best to avoid some common job interview mistakes that can end up costing you an ideal position at the company. No one expects you to know the history of the company you’re interviewing for, but you definitely should know the brand’s USPs (unique selling points). What’s more, if the company specializes in offering specific products or services, you should at least know what these are and how they can help potential customers. In all honesty, no one is going to take you seriously if you come to an interview ready to talk only about yourself and without a single piece of information about the company you’re trying to get the job at. In the end, the interviewer may not even ask you something like this, but in the event they do, you should be prepared. Not to mention that using the company’s product or service as your own motivation to work for them can turn out to be a significant advantage. You’re keen to get a job but you don’t really care about the company that offers the job? Well, if that’s the case don’t let it show. Apathetic and disinterested behavior is definitely one of the biggest job interview mistakes and it will put the interviewer right off. So, even if you may not be all that excited about joining the company you’re interviewing for, don’t give a half-hearted reply that clearly shows your indifference. Instead, opt for a strong approach and talk about just how excited you are for new learning opportunities that this company will provide you with. Many interviewers will ask about your own views and things you’re looking to achieve in the position that they offer. While it’s always nice to be assertive and self-aware, don’t talk about using this job as your stepping stone. When they’re looking for someone to join their company, interviewers want people who are willing and excited to work as a part of the team to better both the company and themselves. Not someone who’s only going to be focused on their own success and things they can get from the job. So, be aware of what this job would give you, but also focus on everything that you could give to the company while doing the job in question. Nobody likes to share their weaknesses with others while coming up with concrete strengths can be equally challenging. Basically, you don’t want to sound perfect as that just seems unrealistic, and you don’t want to be too negative either. But, most importantly, you should never give answers that have no actual meaning for the interviewer. So, no answers like: I always put all I’ve got in what I do but I tend to care too much. When they ask you for your opinion on your own weaknesses and strengths, make sure to clearly verbalize things you’re very skilled at as well as some things you believe you can improve upon. Your willingness to work on your weaknesses will make you more attractive as a candidate than saying you have no weaknesses at all, or using an emotional concept to ease your way out. Obviously, you want to sell yourself in the interview. But, you don’t want to appear like you’re not even listening to the interviewer. 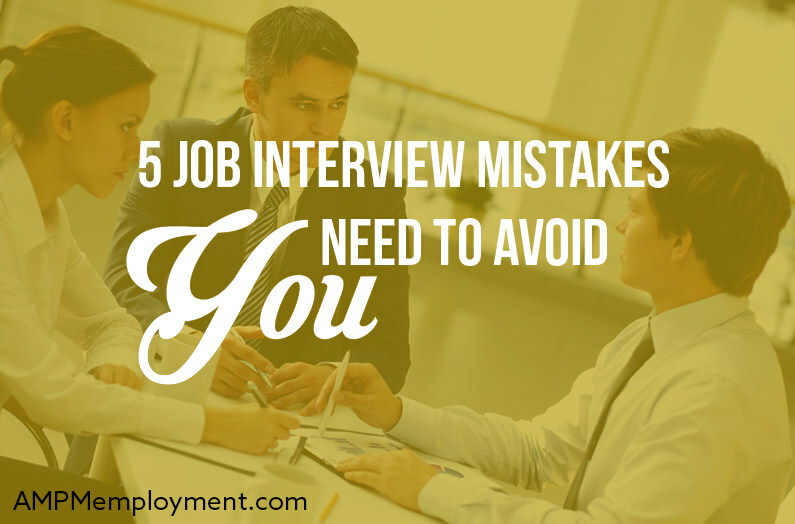 One of the most common job interview mistakes involves your complete disregard for what the interviewer has to say. Don’t interrupt when they’re talking in order to say how you would act in a certain situation or what you’d do to fix the problem. Only do that when asked. Otherwise, you will appear as a rude and very poor listener who only cares about presenting yourself. The lack of interest in what others have to say is not a trait people generally like to have on their team. Be confident but realistic; open and assertive yet attentive and respectful. Know your own worth but understand the value of the company looking for someone like you as well. And once you know what job interview mistakes you have to look out for, your job hunting will become more effective and successful.